I love television. For too long, small-screen entertainment has been regarded as something lesser than its larger, more feature-filmy counterpart, and that's a shame. Television has been rallying, and we're reaping the benefits. Sure, there are some astounding clunkers, but television is getting better and better. Writing is more compelling, better actors are becoming attached to televised projects. This could have something to do with societal changes or pressures, or people could be thinking, en masse, going out and dropping a frankly ridiculous amount of money to see a movie seems a little ludicrous when one can sit at home on one's couch and be just as entertained. The reason is much simpler, and is tied to the rapid evolution of technology. The expansion of television away from the television set has resulted in better TV. The average sitcom or procedural show has benefitted from standard television airing. This programming can get away with being repetitive and derivative because the audience has a week in between viewings. When viewed back-to-back, though, this type of programming appears tedious and dull. Streaming of television programming through Netflix and Hulu, even the use of the now-seemingly-standard DVR, is altering television for the massively better. Think of what can be achieved when television creators eschew the sitcom schlock and recognize the possibility of telling more intelligently crafted stories. The plots can be thicker, the allusions can be more obscure, and we can unravel more intricate mysteries when allowed to watch television at our own pace. Soon, the nature of television will evolve faster than the devices which can now stream it. These changes are affecting not only the way in which we watch TV, but the quality of programs we're watching. Television creators have begun to adjust for this new alternative viewing style. These adjustments are slowly becoming evident in programming, and shows are more profound and cleverer as a result. It's true some of this depth can be attributed to the prevalence of television releases on DVD. The eventual sale of television programs has had a visible effect on the scripting and filming of shows, an effect that predates the availability of alternative viewing. This is a prediction, though: As shows are made available for viewing in alternative formats (streaming, on handheld devices, etc), we will see more intelligent, denser programming. The best example I can think of is the most genuine mystery to air in recent years: Lost. As I've mentioned before, I have a bit of an addictive personality. This is not an asset in most aspects of life, but it is aptly suited to catching up on television. Lost I watched, start to finish, in two weeks. The show was obviously a game-changer in the field of network television. It was layered, it was baffling, and it was what everyone wanted to talk the morning after it aired. I can't count the conversations I observed where a co-worker walked up, heard "island," or "Sayid," or "Other," and shrieked, "Are you talking about Lost?" Hands clamped firmly over ears, the interloper would hum loudly, or flee the scene. I'm proudly spoiler-free, and even I couldn't understand the cult of ignorance surrounding unseen episodes. Once I started watching the show, though, I became a madwoman, likely to smack feeble, elderly family upside the head for revealing the smallest detail. Watching Lost had its ups and downs, but there was always a sense of puzzle-solving. "What was the relevance of that book?" was the big one in my house, but there were so many more, both grand and miniscule. Watching the show as a condensed experience obviously made tracking the subtext simpler, but it also heightened the watching experience to an almost personal level. It's like the old analogy saying we invite television characters into our homes for an hour a week; the Oceanic Six practically set up camp on my couch. My relationship to the show eventually reached the point that I could one-up die-hard Lost fans, who had made a weekly date with their television sets for years. Lieber, Abrams, and Lindelof had to know weekly viewing made catching every reference impossible. Why work so hard for something that everyone might miss? The show's creators recognized the possibility viewers might opt to watch the show back-to-back, and those dudes are pretty smart. Nielsen reported the Season Three drop in ratings was because Lost was the most DVRed show on television. 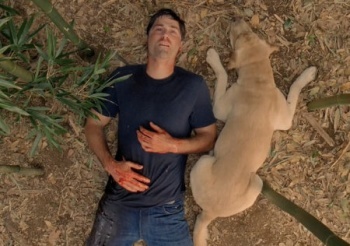 Lost was also one of the first shows to be sold via iTunes for viewing on a computer or handheld device. I mean no disrespect in saying the show's depth of mythology was a reactionary move to the newly opened avenues of television viewing, but the creators and executive producers were thinking outside the box of traditional broadcasting, and making a more intense, immersive viewing experience available to their audience. This is indicative of a larger shift in the television landscape. There are, of course, costs involved. Netflix costs, DVR costs, Hulu Premium costs, now, too. The less literal price is a change in how we approach and understand our favorite shows. Time for reflection is entirely up to the viewer: without the mandated week between episodes, it's all too simple to hit "play" on the next without taking time to consider the ramifications of what you just watched. Like all choices in life, there are trade-offs; for me, cliffhangers are less exciting than connecting scripted clues. Also, marathoning a show, as I often do, is pretty impractical. It may one day become more efficient to join the legions of people who no longer have a television set, but for the moment, I say we accept the expansion of television past the set and appreciate the wealth of intelligent programming it's sure to provide. Right now, the Netflix queue currently has Skins, Season Four of Doctor Who, The Wire, Mad Men, Torchwood, and The Guild, all patiently waiting for the opportunity to entertain me. I'll watch them on my television, and revel in their liberation from its tyranny of channel and schedule.